New Technology Cooks Bacon in Microwave. New Technology Cooks Bacon in Microwave... Faster, Healthier, Crispier and It Tastes Great Too! The Bacon Wave is fast, healthy, and with no mess! The Bacon Wave Cooks Bacon With Less Fat, Less Calories, And Less Cholesterol! The Bacon Wave is Stackable, you can cook up to 28 pieces at once! It&apos;s As Easy As... Place bacon strips on special cooking rods.Serve and enjoy perfect bacon every time! A cooking guide is included with each Bacon Wave! It is a terrific time saver particularly when I have overnight company and need to make a big breakfast for them in the mornings. EASY TO USE...COOKS BACON PERFECT! This makes the best bacon in just a short time. Bacon comes out crisp and is not at all greasy! I was surprised how good my bacon tasted. Everyone that cooks bacon needs this product! I use thick sliced bacon. I cook 7 slices at a time and thay always come out just rite. 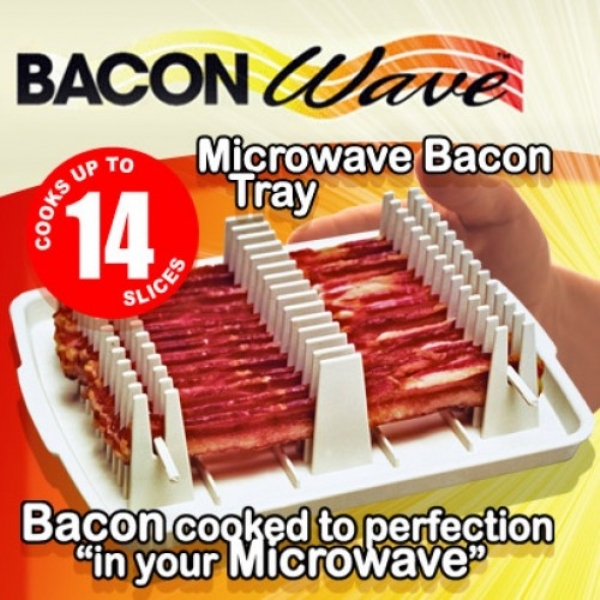 It is the best microwave bacon cooker out there. I love how quick and easy this is, i have twins so i cant spend to long hanging over the stove to watch bacon. just throw this in the microwave and thats it. I think it actually gets bacon crispier and so much greas drips off. I use it for making the BEST Breakfasts EVER!